For the past couple of weeks we have been busy hopping around the quilty blog universe as part of an inspiring blog hop. Today is our stop. Everyday Fray, a play on words representing both a take on our busy lives and our love of daily craft sessions. Basically the frayed edges of the everyday. To make life simple, our post titles tell you who they're from. A & K, is short for Amanda and Kelsey. The short version is that we're cousins, we live in different parts of the country and we love to sew. You can read the long version here. We both do our finest work on a Janome 4100 QDC. Amanda bought hers after falling hard for some Heather Ross Goldfish fabric on or about a rather notable birthday. Kelsey followed suit after realizing that buying the same machine meant free round-the-clock tech support. As the primary component of our carry-on baggage allowance while traveling, both of our machines have racked up more frequent flyer miles than your average Singer. If you haven't been there before, you might want to consider that dragging a sewing machine through airport security usually leads to interesting off-script conversations with security personnel. After realizing that it was actually a real live sewing machine going through the x-ray scanner, a particularly diligent security officer recently asked Kelsey if she actually sewed...which naturally begs the question of why else would one be schlepping a 20lb sewing machine around an airport (perhaps the newest fad fitness regime?!?). What you'll see here if you stick around is that Amanda has a special talent for starting new projects while Kelsey is more likely to actually finish them. Perhaps the most amusing part of this dynamic is the fact that Amanda's WiPs also seem to be on Kelsey's "To Finish" list. More than once, Amanda has had to fend off Kelsey's attempts to adopt a few of her long forgotten WiPs. Kelsey's propensity for order extends beyond her fixation on WiPs. She is a master list maker and has the annoyingly well organized craft room. For your sake, Amanda's craft space sprawl has never been featured on the blog. Sprawl really is the right word for it. When we aren't busy quilting, knitting or stitching at home, we do our best to fit in some travel where we can (small craft projects in hand of course). 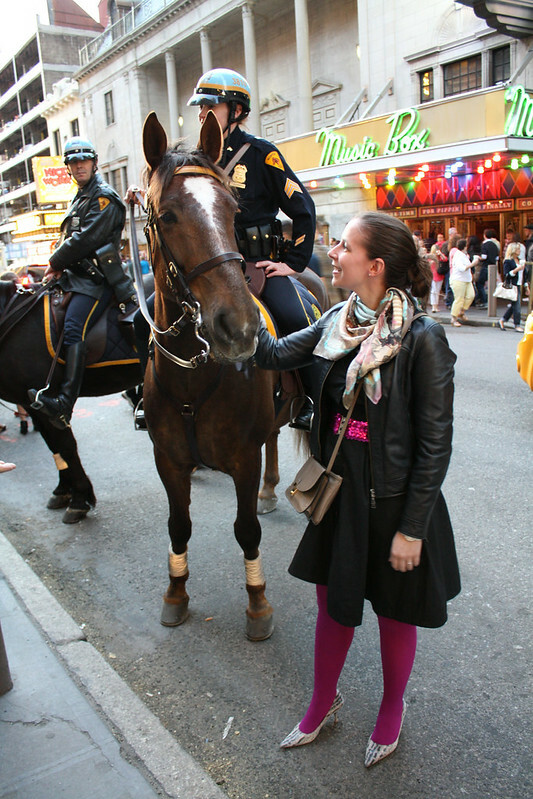 We try to share some snippets of trips here on the blog (found here). These days you can also find us on Instagram and Flickr. If you have a few minutes, don't forget to visit the other blogs on this week's hop. I can tell y'all are fun fun fun! New subscriber. Great post ladies! That bit about the airport security guy, priceless! Looking forward to more awesomeness, you know i already follow but you've picked up a new IG and Flickr follower! Very nice to meet you both! That swoon is soooo fabulous. I just love it :) You guys seem like you have a lot of fun! Great to meet you two through the blog hop! It must be nice to be able to share this love of crafting and sewing with each other. I have enjoyed seeing what you two have been up to this summer and am looking forward to seeing what comes next! Great post ladies! That swoon makes me swoon :) The colors are perfection!! Great blog - thanks for sharing! So funny! And such enjoyable reading, thank you! Love the projects, love the fact you have each other (and the tech support comment was just way too hilarious!). Your projects' are gorgeous and I will definitely be coming back to check in on your adventures. Nice to meet you both! Great introduction post! Can you believe I have never (yet) taken my sewing machine on a plane? I have my first sewing trip away in October and I think I need to get a travel case (preferably with wheels!) sorted asap! Any tips you've got for travelling with sewing machine would be gratefully received! And by the way, that question sounds like the question I was asked at the first quilt guild meeting I went to... "do you quilt?". Ummmm - why else would I be here? so funny to imagine you at the airport. I got a great chuckle out of that! 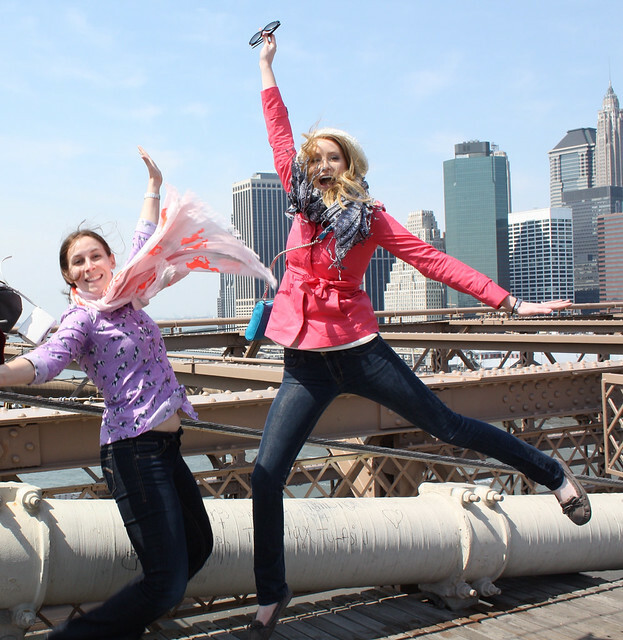 It's so wonderful to learn more about you two through the blog hop and I'm a new bloglovin' follower! It's nice to meet you two. I am in awe over the design wall. Would love to have something like that at home!! I wouldn't trust my machine going into the cargo pit either! I love your airport story, how funny! I was recently at a park near my house (the park was in Beverly Hills) photographing a quilt. Someone came up to me and asked where I bought the quilt and I told her that I made it. She gave me a blank stare and then asked, "Really? Like with a sewing machine?" Ha ha. Perfect! How much fun to have a cousin to conspire with! Love it! Sewing machines and TSA is an adventure I have yet to try! Thanks for joining the hop! You two are hilarious! I will remember your airport story if I ever need to schlepp my own machine somewhere--and I though laptops were a pain in the neck! Looking forward to seeing what you start and finish in the future! 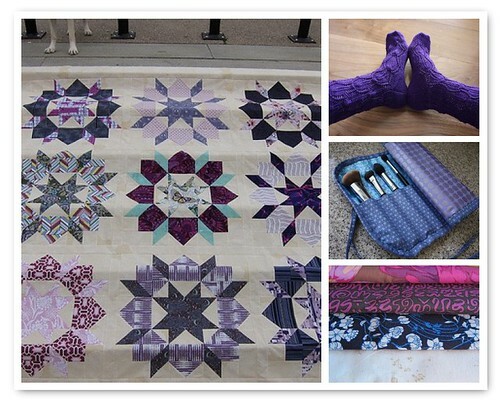 I love a blog with gorgeous projects AND a fantastic sense of humor - you both are killing it! Love that swoon and can't wait to see what you're working on next! 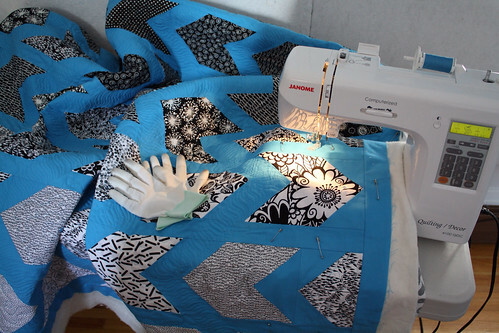 How fun having a "quilting / sewing" partner like you guys have with each other. What fun! Gorgeous projects. I clicked over to check out your craft room, K. And A, we are moving into a new house next week and I plan to have a "sewing room clean up along" as I set up my new space. Perhaps you'd like to join me? I love the dynamic you two have! I'm glad I found you on the blog hop because I'm a committed follower now! Your class with Lizzy House must have been a fantastic experience! I'm also looking forward to coming back to your blog for another visit! I've been following a while so it is great to learn a little more about you. I love the blue and black/white chevron quilt. Great to meet you! Your swoon is beautiful and well done on lugging your machines about not sure I would want to be taking mine on a plane! (Great tights by the way). I'm so pleased I found your blog! You two are fantastic! Love your work, your style, and the fun you both seem to have. :) You make me wish I had a cousin who sewed! Lovely to meet you guys! You had one of the best introductions to the blog hop that I have read! I look forward to checking out your blog more. I am also a follower now! Hi guys! You and your work are cute. :) Nice to meet you. What a fun post! How great that you two are able to share so much. Glad to be introduced to you - I will be following your adventures. I had to poke around a little (SUCH a horrible chore, not) to find out about that gorgeous blue-and-purple flower blouse in the second mosaic. That pattern is going on my list for sure, and I totally had that fabric pegged as Liberty lawn, even though it's not (for $8/yard?! a steal). Very lovely! So fun that you share a love for crafting! I tried to unsuccessfully teach my cousin to sew once - what a disaster! Girls, what a great blog post! I adore the First Lessons in Colour Quilt - so simple, but so effective. You are determined for taking the sewing machine on a plane - I can hardly be bothered to take mine across town! Always good to read your posts! Tho' I think until I meet you in person it'll be hard to work out exactly who's who! Now I'll have to find you on Flickr too! oh, hey, lovelies! finally figured out why i couldn't post - i wasn't signed in. DUH. so now that i've read this post 4 times, :), wanted to say how much i love that y'all do this together. love your projects, love your trips, and so enjoy seeing all these memories you're making together! love the blog! I love the comraderie between you too. Great to have a constant companion to sew with. Lovely post from two lovely ladies! I love your collaborative efforts & am really enjoying following your blog! 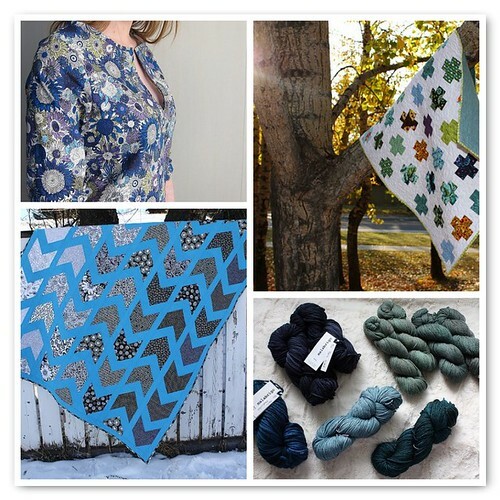 Here via the hop - I'm super loving the swoon quilt and fabrics! !